Some will tell you, Bill Belichick is the King of driving a highly accountable culture. Less than two decades ago he became the Head Coach of the New England Patriots and during his tenure, Bill Belichick led his team to an NFL record – 15 AFC East Division titles, 8 Superbowl appearances, and 5 Superbowl Championships. 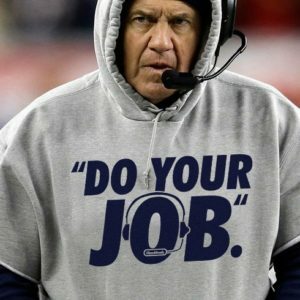 When you look at some of the NFL’s greatest Head Coaches; Vince Lombardi, Chuck Knoll, and Bill Belichick, they all share a common trait – they established a culture of accountability in the organization they lead. As a Business Leader, there is a lot we can learn from these coaching legends, and regardless of the organization or the industry, developing a culture of accountability in the workplace is critical to the success of your employees and to your business. Without accountability, employees may be tempted to waste time, take shortcuts, and miss desired goals. This will ultimately increase your costs, limit your growth, and expose you to unwanted risk. As a Leader, you are ultimately accountable for what happens in your team. However, that doesn’t mean a Leader has to be the only accountable person in a team. You need to ensure employees take ownership too. The process to improve employee accountability relies on one simple thing: communication. It sounds simple; however, many Leaders find establishing a clear and constant communication line between Leaders and employees challenging. Establishing an accountable culture will have positive impacts on employee morale, customer satisfaction, and Company financial performance. Let’s look at 8 proven suggestions that will help you establish a culture of accountability. 1. Hire people who possess self-responsibility. One of the largest responsibilities a Leader has is hiring the right people…it can also be one of the most challenging. When considering candidates, digging into their past behaviors is the best predictor of future behavior. Most HR professionals would agree, it’s important to probe for past behaviors, actions, and their results. Get insights of how an employee might perform in your organization. When recruiting candidates, look for people with a demonstrated history of accountability. There are very good assessments tools available that can help demystify this critical competency and help determine a candidate’s level of accountability. 2. Establish clear roles and individual ownership. People struggle to be accountable when roles, KPI’s (key performance indicators) and processes are ambiguous. Removing as much confusion as possible about who is doing what, how they will proceed, and what equals success is a crucial step in establishing accountability. People help support what they help create. Develop clear KPI’s, forecast, and processes with the employees responsible to execute. Ideally let the employee who owns the initiative set the KPI’s, forecast or processes and present them to Leadership for feedback or approval. Leadership needs to make it a joint effort in obtaining complete agreement on any adjustments. It’s important each employee agrees that the established KPI’s, forecast, and processes are achievable and confirms they have a clear path to execute. Sandler Rule: A life without risk, is a life without growth. 4. Freedom to navigate priorities. Most challenges and problems have multiple right answers, so give your people the freedom and control they need to make decisions. The first solutions your teams and direct reports come up with will probably be pretty good. However, as a Leader, it’s important for you to improve upon them instead of inserting your own. Be sure your employees have the resources, knowledge, and assistance they need. With this approach, employees increase their skills, confidence, and ownership. 5. It’s all about improvement. Accountability is the foundation for creating a learning organization. If you want to create a quality Organization that is scalable, you need to be able to see what’s working and what isn’t – and analyze the cause. Establish an environment where each employee can honestly say what they knew, what they thought and what they did (or didn’t do). 6. Develop the expectation of being held accountable. In accountable organizations, no one expects to “stay under the radar.” In fact, people seek feedback because they know it is intended to improve and add to their knowledge. Establish frequent feedback and discussions of established goals, objectives, and the related results. Organizations lacking feedback mechanisms only discover shortcomings when it is too late. In accountable cultures, people are called out if they don’t do what they say they will do. When accountable employees fall short, they admit it, course correct, and work to improve. If you have an employee who consistently falls short, this is a sign of poor know-how, an indicator that something is missing in his/ her commitment to accountability, or both. This is not the time be concerned about political correctness or diplomacy – the stakes are too high. Leaders need to act with a sense of urgency, directly and professionally engage with the employee who consistently falls short. If not, the negative compounding impact can be immense, organizationally and financially! Look to swiftly learn what is the employee doing that they shouldn’t be doing and what isn’t the employee doing that they should be doing? The devil is in the details and the Leader needs to quickly identify the issues and course correct. 8. People outgrow Companies or Companies outgrow people. Do not assume people and companies grow at the same pace. If your organization is an emerging growth company, then your company will eventually outgrow employees. Sadly, a rapidly growing business will even outgrow long-standing employees – it’s never easy. As a Leader in a rapidly growing company, you have to recognize this challenge and be ready to swiftly address it. Find them a role in the company where they can provide value and where they can excel. Coach them out. Once again, it’s never easy, but growth companies require a unique mindset. For those people that ultimately can’t “make the leap”, you have a responsibility to “coach them out”. You have to help these individuals realize that your company is no longer the best fit for them. If you want to establish a culture of winning and drive rapid growth, you must always be working to have the best possible talent and experience in place (at every level) to maximize tomorrows desired results. Sandler Rule: There is no such thing as a good try. Join us for our next Leadership Workshop. Learn more at tps@sandler.com/leadership. Happy hunting and good selling!